Last Friday I visited Brixton in south London to visit Brixton Energy. 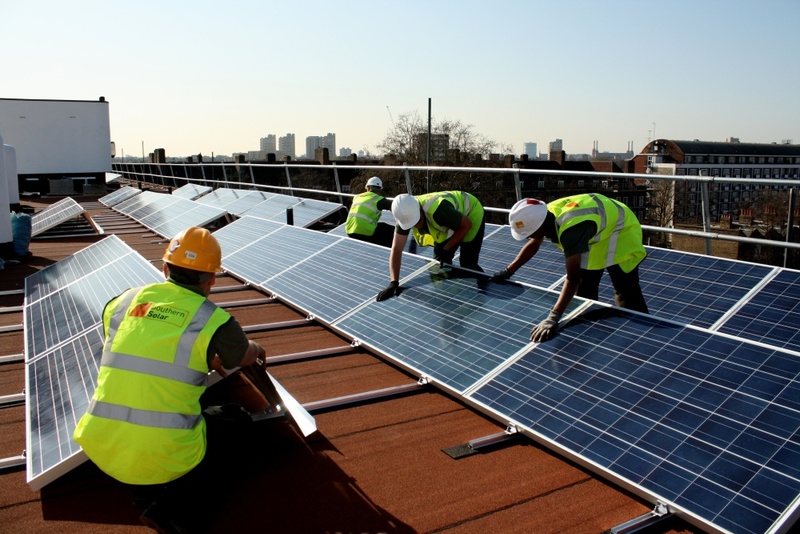 Brixton Energy had just closed its second share launch, Brixton Energy Solar 2, which had raised £70,000. Its first project, Brixton Energy Solar 1, was the UK’s first inner-city community-owned solar power station, a 37kW solar array on the roof of Elmore House on the Loughborough Estate. The second was a 45kW system spread over the roofs of the 4 housing blocks of Styles Gardens. I joined Agamemnon Otero of Brixton Energy on the roof of a neighbouring tower block on a crisp and clear winter day, with a clear view over the solar systems that Brixton Energy had already installed (see picture above), to ask him more about the project. “I’m Agamemnon Otero, I’m a director for Brixton Energy and Repowering South London. I set up decentralised, cooperatively owned renewable energy projects. A few years ago Transition Town Brixton (TTB) heard I was working on my Masters thesis around social responsibility and community-owned energy and how to facilitate low carbon economies, and asked me to do a talk at an event. Their buildings and energy group had dissolved some time earlier. Before and after the installation of Brixton Energy Solar 1. A bunch of people were interested, so we formed a working group. For 5 months we met every couple of weeks. The group that met were loosely affiliated with TTB, or Green Community Champions but was glued together by the desire for wellbeing in our community. Some had experience in renewable energy and some did not, but all met weekly in pubs and monthly TTB Shared Space events. It became regular when we changed the dynamic and began using Transition principles: like listen to hear, and decide by consensus. Sometimes in the Transition movement good ideas will come, but the energy peters out. Maybe its because there’s no money or it takes a lot of time. Sometimes it’s because the people you want to help just don’t want your help! Sometimes its that white middle class “we’re trying to help you” thing, and no-one likes that, especially not here in Brixton. So we knocked on doors and find out what people want. You know, we did public engagement and served organic bread and lentils, but people wanted sandwiches and crisps, so we served sandwiches and crisps. People also felt more comfortable in their own hood; in their local pub or community centre. You can think stuff up in a good-intention-glass-tower and hope it’s going work, but you’ll never know until you get on the ground. Success came to us because we communicate and listen, co-producing our ideas with the local community. 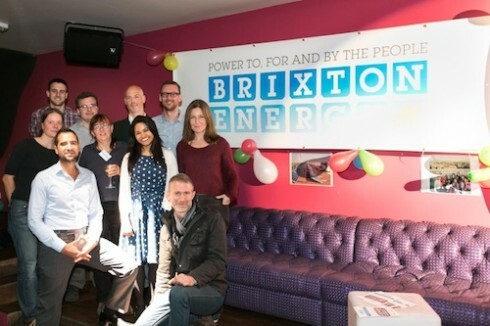 The Brixton Energy team at last month’s launch of the Brixton Energy Solar 2 investment period. Structurally: Repowering South London is the constituted body that co-produces individual cooperative power stations; Brixton Energy Solar 1, Brixton Energy Solar 2, Brixton Energy Solar 3 and so on. Repowering South London carries out the financial modelling, the legal work, bid writing, and technical modelling, the major work of communicating with the community, and knocking on doors community events comes from a mixture of TTB and activated local people. I have had a few director positions in finance and renewables. I never thought we’d have a problem raising the money. 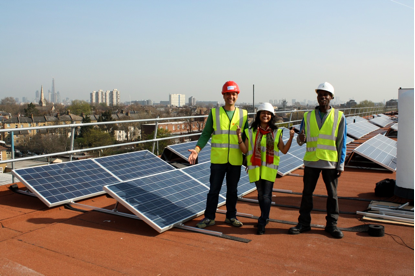 Our target for Brixton Energy Solar 1 (an installation of 37kW on Elmore House on the Loughborough Estate), was £60,000. I thought the difficulty would be to get the people on the estates to want it. Our surveys showed many believe solar panels don’t work in the “wet & grey” UK! To convince our people otherwise was a tall order. Not only to believe in solar panels could work on their roof but to take a chance and invest it was a big ask. We did lots of engagements. Which started with knocking on doors and inviting people to do solar panel making workshops, and to attend draught busting and energy advice surgery. It wasn’t easy from our side either. Its tough to get our own volunteers out to knock on doors in the rain, in the dark, and in the cold, but we did. In the end the investment itself came from canvassing the local farmers’ market, calling friends and family, using TTB’s network, and saying “this is what we’re doing “ and we raised the money in a month. Agamemnon, Avsheen and Kevin during the installation of Brixton Energy Solar 2. Brixton Energy Solar 2 is our most recent project. It is a 45kW array on the roofs of 5 housing blocks on the same estate as the first scheme. The panels are now in, and they were successfully paid off two days ago. We’ve had 5 young people from the estate doing paid work experience installing the panels. We’ve had local young people doing apprenticeships in finance, legal, IT, PR and technical installation, helping to work on the process. In a survey we did before the panels were installed, 98% stated that they wanted it to happen, and that they believed that being co-operatively owned is a good thing. What’s great is that they heard about it from the other part of the estate, where Brixton Energy Solar 1 happened. On the Brixton Energy Solar 1 survey only 20% said that they knew about solar panels but they thought it was a good idea. 60% said they thought it was a good idea to have renewables and 30% that they should be co-operatively owned. But on the second project as I said everybody already knew how solar works. After that happened it is spread like wildfire, to the point where Brixton Energy Solar 2 was a huge success, and up the road another block heard about this. 98% surveyed of this new estate want it, so it will be Brixton Energy Solar 3 launching February 2013! 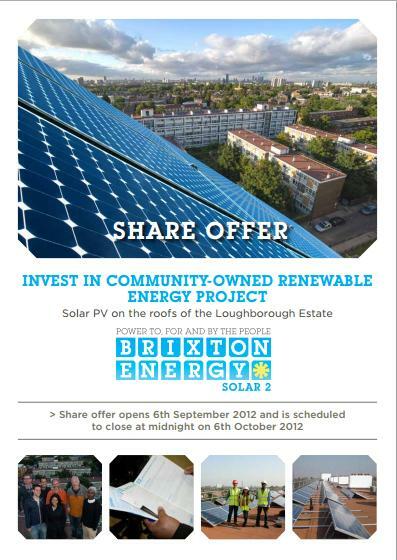 The share document for Brixton Energy Solar 2. When you build people and community into a project, you allow local ownership, you create jobs, you create apprenticeships for young people, and you reduce energy use in the building: people get interested and that news travels fast. Financially: Brixton Solar 1 raised £58,000, Brixton Solar 2 raised £60,000 and Solar 3 will raise £67,000. Investors make up to a 5% return, and then with tax incentives, they effectively receive up to 7.5%, and the whole local community gets a financial return through the Community Energy Efficiency Fund. Our first one worked out to 4½% return, BES2 will be a 6%, and our next one, Brixton Energy Solar 3, will be up to 7.5%. With Brixton Solar 2, the big mommas of the community got behind us. Lovely, strong power woman who know everyone and do just about anything better than you or I could, while they are cooking a meal and talking on the phone. For example the woman who lives in that flat there, her son, her two daughters, and her friends, and then their cousins who live in the place we’re going to do Brixton Solar 3, came to the events and got involved in the work experience and management. Another local businesswoman who has shops throughout Brixton invested, and the women in that large tower block invested, but she and the others speak highly of us, which is the strongest endorsement one could get. In total 15% of the people from these buildings invested in these buildings, and then more from the estate. 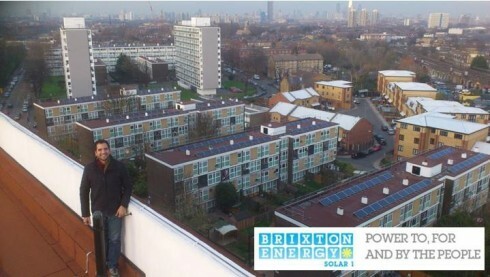 In the next project, Brixton Energy Solar 3, the people on the estate see it has good investment and will attract more. It’s not just people here in Brixton on the estates, its open to all UK residents who believe in this type of innovation. People invest from £250 to £20,000, and in Brixton Solar 1, about 70% of it was in £250 amounts. There were 103 investors. One person did £5,000, two people who did £1,000, about 4 £750s, and 15 £500s, and the rest was £250s. The demographic was very Transition Town, people who believed in it, invested £250, but didn’t really expect it back. I don’t think they really believed they were going to get a return. The figures are just in and it’s going to be good, when they actually do get their return, they’ll be psyched! Brixton Energy Solar 2 was completely different. The £250s were coming from people who lived on the estate. And then you had local and people as far afield as Aberdeen saying, “why should I put my money in an ISA? I’m going to put my hard earned money into this. You’ve done it before, we know it works”. We got a couple of £5000s, a lot of £1000s, there were 70 investors all together. In the next one there are already people coming with £5,000 and £10,000. When you go onto the financial markets, no one is offering a secure return; everyone is offering index-linked/tracked. Not even Triodos is offering 7.5% returns. And you don’t get your money back at the end. Here, if you put £1000 in at the start, in 2012, in 2032, you get back your £1,000, plus every year you’ll get a 5% return, and next year, on April 1st, you will get £500 (half of what you invested) as a tax deduction from the government under Seed Enterprise Investment Scheme. And best of all a specially-created Community Energy Efficiency Fund will generate £6000 over the next 20 years and we’ve already match-funded BES1 & BES2 so there’s £12,000 raised for apprenticeships, draught busting, and reducing energy consumption for each project! It’s about the whole concept of wellbeing. As I said the idea took years. Planning our first project took us 8-9 months, the second one took us 3 months, and the third project took our amazing team a month. And now we have 6 more sites in development. What were the moments during this process which have felt especially thrilling? The first was when I was working on these ideas as part of my Masters and I was thinking “this could actually work, and this is how you do it. The UK has £7 trillion of housing stock, £2 trillion of them homeowner owned, £3 trillion of them are social housing; we could link this up. You look at the assets of the UK, you can say we only need £2 trillion to develop the UK renewable energy copacity and be a net energy exporter”. At our community engagement events/ workshops and people would say, “I hope you guys can do this again for us and other people”. Our Solar Panel Making Workshops attract, mom’s, grandparents, little kids from the estate and beyond. They’d be making these small solar panels, and saying, “this works”. Once I was in the HSBC headquarters on the 42nd floor of Canary Wharf. I was giving a presentation about how supporting local community projects is a good idea…after I’d finished an executive came up and said “I was at that presentation you gave two years ago, and I got up and left, thinking there’s so much good intention in Transition but no-one ever makes anything happen. I wish now I’d never got up from that meeting, because everything you said you were going to do two years ago, you’ve done. I invested in the first project, and I invested in the second project, but I wish I had stayed to be a part of this team”. For me, that was worth a lot. Another time, a woman who lives here, a single mum, 4 kids, with 2 jobs, said, “this is good. I’m saving money on my energy bills, my kids got inspired in your workshops”. She then said, “I just hope this can go to other estates”. When you link all those people up, for me, the hairs continue to stay up! Ultimately, what we are about is trying to co-produce well-being. To listen on the ground, and to make people warmer, giving kids a chance to get inspired and adults work opportunities. Solar powered energy is just a financial way to get there. We’re not wedded to solar panels, or Combined Heat and Power, or whatever. We’re wedded to wellbeing. The only way people actually ever believe in themselves and get involved is when they’re allowed to be involved. As soon as you take responsibility for something and you give and you take back and you give and you take back, you develop self will and self belief, and that’s what’s been taken away from people. Again and again I see that the best way to get people involved is to allow them to take back part of their own autonomy. It’s like you distil a sourdough culture into the people and then they rise! Power to for and by the people”. Inspiring. Thanks for your great work Agamemnon and the rest of the team. What an inspirational sunshine story. We would be interested to see the full business plan for your project as FIT for PV keeps dropping although so does the price of solar panels. Feel free to email the business plan to info@powerinthecommunity.org. What incredible success is being created and what enterprise is being shown. Everyone’s hard work and dedication is bringing results. Surely this has got to be the way forward. As a retired community development worker I can identify with some of your experiences, especially the big momma’s, and miss those Eureka! moments. Absolutely super. I really like the analogy – instill a little sourdough culture and the community keep rising. Wellbeing is getting people excited to participate. Bravo and hurrah for Agamemnon Otero. Fantastic article about a fantastic project! Hope this big success story for a community goes on to sow it’s seeds all over, inspiring other similar projects! Very inspiring, Aga. Let me know when and where the next get-together is….. I would like to get involved. Felicitaciones, por esa gran tarea de cambiar el mundo. Me gustaría saber de las bondades que existirían en los países tropicales como Colombia.